An intense, versatile and highly skilled actor, John Simm's career has intrigued from the outset, thanks to his determination to work with Britain's most striking contemporary writers and directors. He was born on July 10th, 1970, in Leeds, and trained as an actor at the Drama Centre, London. His early performances were small parts in such programmes as Rumpole of the Bailey (Thames, 1992) and Heartbeat (Yorkshire, 1993), the usual fare available to young actors with regional accents. His first lead as a film actor was in the unexceptional football hooliganism drama Boston Kickout (d. Paul Hills, 1995), but its release coincided with a menacing, striking cameo in Cracker (Granada, 1995). As a result of this, Simm was given the pivotal role of Danny Kavanagh in Jimmy McGovern's drama The Lakes (BBC, 1997), which showcased his remarkable ability to articulate inner conflict and pain with economy and his laconic manner of delivering often very sparse dialogue. A second series followed in 1999, a year which proved to be something of an annus mirabilis for Simm, containing as it did another magnificent performance in Michael Winterbottom's Wonderland . In a film containing a fine ensemble cast, it was Simm's frustrated salesman who came close to stealing the show. This was counterbalanced by his unexpectedly funny appearance in the drugs'n'clubs comedy Human Traffic (UK/Ireland, d. Justin Kerrigan, 1999). Now something of a cult classic, the film is hardly the artistic equal of his more serious work, but it nevertheless highlights his extraordinary range. This comic streak continued in his work with surprising, highly enjoyable cameos in shows as varied as The II O'Clock Show (Talkback, 2000), its spin-off Meet Ricky Gervais (Talkback, 2000), and, most entertainingly, as a charismatic and mysterious drug dealer in Spaced (LWT, 2001), indicating that he could riff on his deadpan, introverted persona to superb comic effect. However, as if to balance this, some of his television roles became almost self-consciously downbeat and appeared almost to verge on self-parody, as in his performance as a self-loathing former loan shark in Never Never (Company, 2000). It seemed only a matter of time until he took the next step and played one of literature's darkest, most conflicted characters, Raskolnikov in Crime and Punishment (BBC, 2002), where he was upstaged by the flashy direction and Ian McDiarmid's scene-stealing performance as the wily Porfiry. His next cinematic lead, as an ineffectual and mild-mannered librarian opposite Christina Ricci in Miranda (UK/Germany, d. Mark Munden, 2002), suffered from false expectations; he seemed to be permanently on the verge of returning to type, which gave the film a quite unwarranted source of dramatic tension. However, he was far better used as Bernard Sumner in Michael Winterbottom's 24 Hour Party People (UK/ France, Netherlands, 2002), where his gritty, low-key performance anchored the more flamboyant aspects. 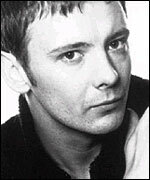 A long-standing New Order fan, Simm not only performed some of the vocals in the film, but has also performed live with the band. His most striking recent work was his performance as a journalist in the superlative State Of Play (BBC, 2003), where he managed to hold his own with remarkable success against two grandstanding (and BAFTA-nominated or winning) performances from Bill Nighy and David Morrissey , as, respectively, his editor and best friend. However, he was also terrific in the updated Canterbury Tales (BBC, 2003), appearing in Tony Marchant's adaptation of The Knight's Tale to great acclaim. Of course, any actor has to lower the quality control occasionally, and Simm's scenery-chewing appearance in the Euro-television 'epic' Imperium: Nemone (EOS, 2004) was only bearable because of the knowledge that, as Caligula, he was going where the likes of Malcolm McDowell , a spiritual forebear, had gone before. He was on far safer ground with the BBC's adaptation of Joe Penhall's medical ethics play Blue/Orange (BBC, 2005), and the time-travelling whodunit Life On Mars (BBC, 2006), which acts as a satisfying synthesis of his dramatic and comedic roles, as well as reinforcing ( thanks to its 1970s setting) the identification between Simm and rock music which is a pleasing spin-off of his career to date.